11/22/12 - Announcement - Blaze Books Offers Exclusive Glenn Beck "Author's Cut"
02/07/12 - Press Release - Copia Debuts "Talk to the Author Inside the Book"
05/24/11 - Press Release - Copia Celebrates Bob Dylan's 70th Birthday With a Free eBook Giveaway of "Revolution in the Air"
02/17/11 - Straight From Hell Blog - Entering a New Golden Age? 02/16/11 - O'Reilly Tools of Change - Sol Rosenberg (Copia Interactive, LLC), "Marketing the Newest Media"
01/03/11 - I4U News - Copia At CES 2011: Making Reading Social Or killing it entirely. You decide. 09/01/10 - Folio Magazine: "New Crop of E-Readers to Hit the Market"
08/20/10 - GigaOM.com: "Just How Social Will the E-book Be?" 08/17/10 - International Business Times: "Copia Brings Alternative to the E-Reader World"
08/09/10 - EContent: "Reading Between the Lines of Copia's E-Reading Approach"
08/09/10 - TheStreet.com: "Amazon Kindle Will Hit $99: Poll"
08/06/10 - Publishers Weekly: "A Peek Inside Copia"
08/06/10 - Publishers Weekly: "A Peek at the August 9 'PW'"
08/06/10 - Connected World Magazine: "Ereader Update: The War Rages On"
08/05/10 - Tech Genie: "Social Ebook Reading Experience: @$99 from Copia"
08/04/10 - The Idea Logical Blog: "Three new ebook platforms nearing their debut"
08/03/10 - Mashable: "$99 Color E-Reader and Social Platform to Challenge Amazon, B&N This Fall"
08/01/10 - Slippery Brick: "Copia Tablet is just $99"
07/30/10 - Huffington Post: "Copia To Introduce $99 eReader: How Low Will Prices Go?" 07/29/10 - Publishers Weekly: "Copia Unveils $99 E-Reader"
07/29/10 - CNET: "Copia announces $99 color e-reader"
07/29/10 - Crunch Gear: "Copia Plans Low-Cost 7" And 10" Tablets As Well As E-Ink Devices"
07/29/10 - Wall Street Journal: "How Low Will E-Reader Prices Go?" 06/10/10 - NY1: "Internet Week Encourages Techies To Make New York Home"
01/12/10 - Library Journal: After Ereaders: Getting Down to Content "Though hardware dominated the CES news, the real shift may come from two new software platforms"
09/10/16 - User Error - Cocoon Backpack! | The Most Organized Tech Bag! 07/16/16 - UnBox Therapy - Gadget Backpack with a Special Trick! 06/22/15 - giftsandcoupons.com - TECH 16" BACKPACK - A really well designed protector backpack for your 16 inch laptop. 01/22/14 - Sara Bareilles - This has changed my life. 01/14/14 - DIY Network - Cocoon SLIM Backpack on "I Want That"
12/30/13 - macsources.com - Grid-It by Cocoon is a favorite gadget from 2013. 12/01/13 - jeffreyphillip.com - The 12 Days of Neatness – Neat Products for Holiday Giving! 11/10/13 - youtube.com - Cocoon Grid It Review: Art School 180º! 07/29/13 - efetividade.net - SLIM: Mochila com Grid-It embutido, para geeks organizados - quer ganhar um Grid-It? 07/23/13 - Junjun's Blog - Cocoon introduces "the world's most intelligent backpack"
07/23/13 - the-gadgeteer.com - Cocoon introduces "the world’s most intelligent backpack"
07/17/13 - Press Release - Cocoon® Launches SLIM Featuring GRID-IT® - the most intelligently organized backpack the world has ever seen! 11/26/12 - apartmenttherapy.com - What do you get the Tech Lover who already has everything? 11/22/11 - Youtube.com - Cocoon GRID-IT! 10/10/11 - NBC 4 - Top Organizing Products Birdie Brennan discusses her top picks for organizing and decluttering your home and office. 08/09/11 - Cocoon and NASA Team Up! 06/14/11 - forums.vr-zone.com - Cocoon Launches Tablet and Notebook Sleeve and Wrap Lines Featuring GRID-IT! 06/08/11 - Press Release - Cocoon Launches Tablet and Notebook Sleeve and Wrap Lines Featuring GRID-IT!™ -- the most intelligent organization tool ever! 01/16/11 - Viewpoints.com - Grid-It is a 5 star winner. I can't do without it. 12/20/10 - Lifehacker.com - How Do I Put Together a Tech Survival Kit? 08/12/10 - mothercraftcoaching.com - Grid-It straps in your stuff. 07/27/10 - lemondrop.com - Cocoon Innovations Organizers Giveaway Winner! 07/22/10 - iphone & ipad blog - Having Trouble Organizing All Of Your Accessories? 07/22/10 - garagesalepreview.com - Having Trouble Organizing All Of Your Accessories? 07/21/10 - gadgeteer.com - Organize your gadgets with GRID-IT! 07/21/10 - jumpstartmypc.com - Don’t Just Toss it in a Bag... GRID-IT! 07/21/10 - Socialjunjun.typepad.com - Organize your gadgets with GRID-IT! 07/20/10 - iphonelife.com - A bag with a bonus! 07/07/10 - lemondrop.com - Cocoon Innovations Organizers Giveaway! 06/15/10 - fashioncentsformom.com - DadsRock Giveaway WINNERS Announced! 06/15/10 - survivingthestores.com - DadsRock Giveaway Winners!! 06/01/10 - SkyMall Magazine - The Ultimate Organizer! 04/01/10 - PC World - What's an Apple iPad Without Special iPad Accessories? 04/01/10 - racked.com - Are you Prepared & Fully Accessorized for Imminent iPad Arrival? 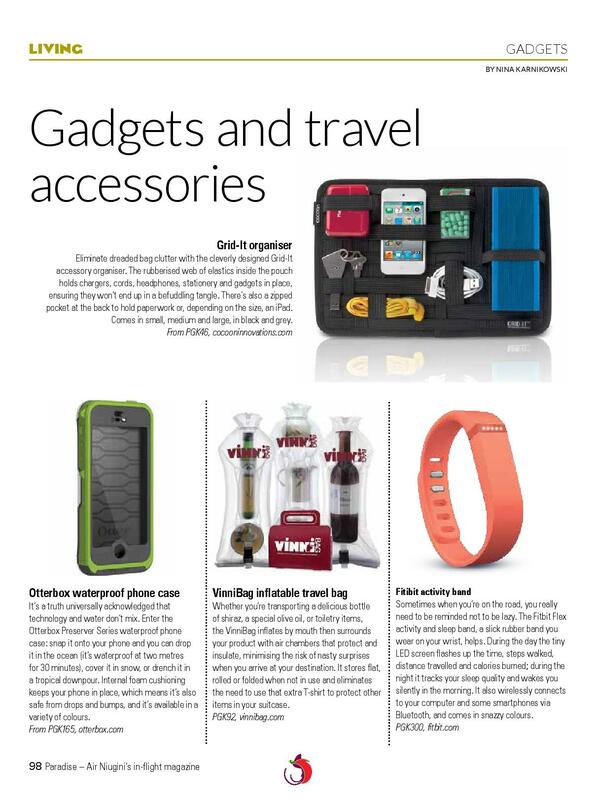 03/17/10 - IndiaTimes - Cocoon Innovations' sleek, messenger sling provides the perfect solution for organizing and securing your Apple iPad. 03/03/10 - rav07 - How To Organize Your Gadgets & Devices... Cocoon GRID-IT! Organizer! 03/03/10 - LESLE MORA BLOG - an overabundance of stuff . . .
02/01/10 - TheAwesomer.com - The jury-s still out on the new iPad, but we like Cocoon-s Gramercy; the messenger sling not only holds an iPad/netboook but includes a GRID-IT system and iPhone/media window. 01/26/10 - How to Grid-It! 01/22/10 - GearDiary.com - Review: Cocoon Innovations GRID-IT! 01/07/10 - TheBBYBestBuyCoInc's Channel - CES 2010 - The Cocoon! 12/02/09 - InoMommy.com - Looking For A Little Organization? 12/01/09 - TheAwesomer.com - Most laptop bags are a jungle of cables, dongles and mice, but Cocoon-s Grid It is a versatile organizer with a weave of rubberized elastic bands that hold everything in place. 11/12/09 - Cocoon Innovations Grid-It! The Device That Could Be Organizing Your Life! 10/14/09 - The Witches Brew - Tech Talk: Grid It! 05/17/09 - CoolThings.com - Innovative Storage: Cocoon Bags Featuring Grid-It. 05/05/09 - Commercial: Not Just Another Pretty Bag! 01/19/09 - FreshArrival - Cocoon Innovations.